Giant passionfruit is a believed to have been originated in South America. Now it is cultivated in tropical lowlands all over the world for its fruits and the flowers which are very ornamental. 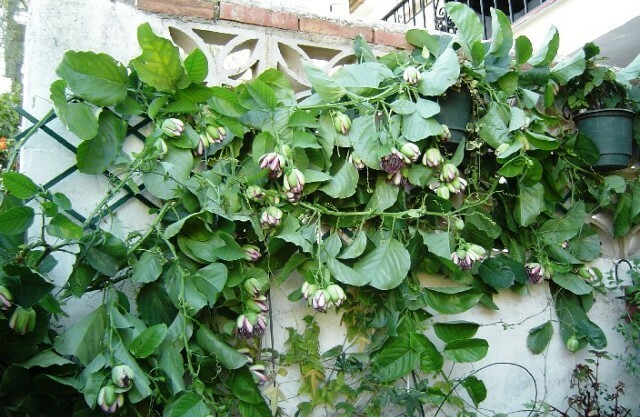 A fast-growing, large climber growing 10-15 m high, coarse, herbaceous but woody at the base, arising from a fleshy root that becomes enlarged with age It has thick 4-angled stems, thick, four 4 angles, prominently winged on the angles; tendrils 30 cm long, flanked by leaf like, ovate or ovate-lanceolate stipules 2-3.5 cm long, sometimes faintly toothed. Leaves alternate, broad-ovate or oblong-ovate, 8.25-15 cm wide, 10-20 cm long, rounded or cordate at the base, abruptly pointed at the apex, sometimes toothed near the base, thin, with conspicuous veins sunken on the upper surface, prominent beneath. Flowers solitary, fragrant, up to12-12.5 cm wide; calyx bell-shaped, sepals 5, greenish or reddish-green on the outside, white, pink or purple inside; petals 5, 4.5 cm long, white-and-pink; corona filaments 2-ranked, 6 cm long, purple-and-white below, blue in the middle, and pinkish-blue above, around the typical complex of pistil, style and stigmas. Fruit oblong-ovoid, 12-15 cm wide, 10-30 cm long, melon like, sometimes faintly ribbed or longitudinally 3-lobed; skin thin, delicate, greenish-white to pale- or deep-yellow, often blushed with pink; flesh firm, mealy, white or pink, 2.5-4 cm thick, flavor very mild, and coated with a parchment-like material on the inner surface. Seeds flattened-oval, purplish-brown, and 1.25 cm long. Jelly can be made from the unpeeled flesh boiled for 2 hours and the pulp simmered separately. The juice strained from both is combined and, with added sugar and lemon juice, is boiled until it jells. The pulp, which is all arils contained in the central cavity, yields a juice suitable for cold drinks. It is bottled in Indonesia and served in restaurants. Wine is made in Australia by mashing several of the whole ripe fruits, adding sugar and warm water and allowing the mix to ferment for 3 weeks, adding 2 pints of brandy, and letting stand for 9 to 12 months. The young, unripe fruits are cooked as a vegetable. The root of old vines is baked and eaten in Jamaica as a substitute for yam. 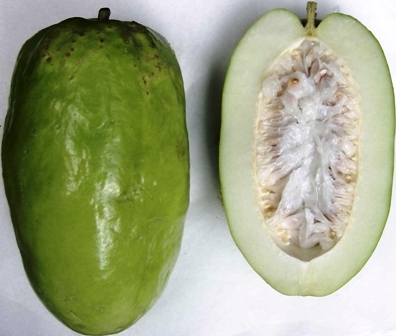 The fruit is valued in the tropics as antiscorbutic and stomachic. In Brazil, the flesh is prescribed as a sedative to relieve nervous headache, asthma, diarrhea, dysentery, neurasthenia and insomnia. The seeds contain a cardiotonic principle, are sedative, and, in large doses, narcotic. The leaf decoction is a vermifuge and is used for bathing skin afflictions. Leaf poultices are applied in liver complaints. The root is employed as an emetic, diuretic and vermifuge. Powdered and mixed with oil, it is applied as a soothing poultice. 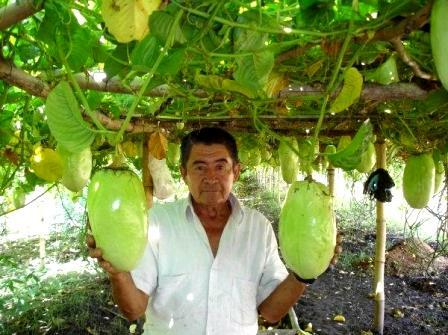 The ideal climate for growing this fruit is one that is truly tropical, warm both day and night, with little fluctuation, and with high humidity. 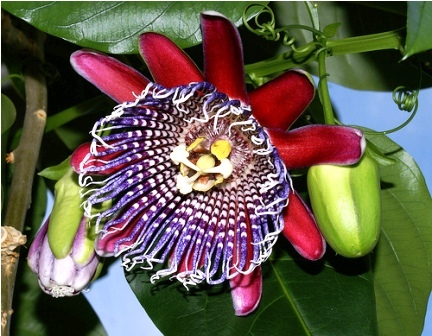 The giant passionfruit grows readily from seeds, which germinate in 2 to 3 weeks and the seedlings can be set out when 6 to 12 in (15-30 cm) high. Cuttings can also be planted which root in 30 days. Ground layering is another convenient alternative for asexual propagation of superior selections. The vines are spaced 2-3 metres apart in commercial plantings of Indonesia. Under ideal topical conditions, these keep producing fruits through out the year. Each vines can bear 25 to 120 fruits per year depending upon the size.